For other uses, see Acoustics (disambiguation). Hearing is one of the most crucial means of survival in the animal world, and speech is one of the most distinctive characteristics of human development and culture. Accordingly, the science of acoustics spreads across many facets of human society—music, medicine, architecture, industrial production, warfare and more. Likewise, animal species such as songbirds and frogs use sound and hearing as a key element of mating rituals or marking territories. Art, craft, science and technology have provoked one another to advance the whole, as in many other fields of knowledge. Robert Bruce Lindsay's 'Wheel of Acoustics' is a well accepted overview of the various fields in acoustics. Acoustic music is a genre of music that comes from the use of instruments that primarily produce a sound solely through acoustic means. Common usage of the term generally means that the music was produced with instruments that produce sound with no electric help. Meaning that the music does not need to electronically amplified to produce a distinct sound. Most instruments are considered acoustic except for the electric guitar, electric keyboard, and. electric drums. The word "acoustic" is derived from the Greek word ἀκουστικός (akoustikos), meaning "of or for hearing, ready to hear"and that from ἀκουστός (akoustos), "heard, audible", which in turn derives from the verb ἀκούω(akouo), "I hear". The Latin synonym is "sonic", after which the term sonics used to be a synonym for acoustics and later a branch of acoustics. Frequenciesabove and below the audible range are called "ultrasonic" and "infrasonic", respectively. 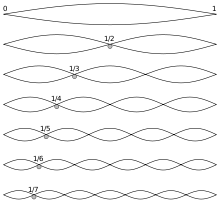 The fundamental and the first 6 overtones of a vibrating string. The earliest records of the study of this phenomenon are attributed to the philosopher Pythagoras in the 6th century BC. In about 20 BC, the Roman architect and engineer Vitruvius wrote a treatise on the acoustic properties of theaters including discussion of interference, echoes, and reverberation—the beginnings of architectural acoustics. In Book V of his De architectura (The Ten Books of Architecture) Vitruvius describes sound as a wave comparable to a water wave extended to three dimensions, which, when interrupted by obstructions, would flow back and break up following waves. He described the ascending seats in ancient theaters as designed to prevent this deterioration of sound and also recommended bronze vessels of appropriate sizes be placed in theaters to resonate with the fourth, fifth and so on, up to the double octave, in order to resonate with the more desirable, harmonious notes. During the Islamic golden age, Abū Rayhān al-Bīrūnī (973-1048) is believed to postulated that the speed of sound was much slower than the speed of light. Principles of acoustics have been applied since ancient times : A Roman theatre in the city of Amman. At Jay Pritzker Pavilion, a LARES system is combined with a zoned sound reinforcement system, both suspended on an overhead steel trellis, to synthesize an indoor acoustic environment outdoors. Spectrogram of a young girl saying "oh, no"
There are many types of acoustician, but they usually have a Bachelor's degree or higher qualification. Some possess a degree in acoustics, while others enter the discipline via studies in fields such as physics or engineering. Much work in acoustics requires a good grounding in Mathematics and science. Many acoustic scientists work in research and development. Some conduct basic research to advance our knowledge of the perception (e.g. hearing, psychoacoustics or neurophysiology) of speech, music and noise. Other acoustic scientists advance understanding of how sound is affected as it moves through environments, e.g. Underwater acoustics, Architectural acoustics or Structural acoustics. Other areas of work are listed under subdisciplines below. Acoustic scientists work in government, university and private industry laboratories. Many go on to work in Acoustical Engineering. Some positions, such as Faculty (academic staff) require a Doctor of Philosophy. Archaeoacoustics, also known as the archaeology of sound, is one of the only ways to experience the past with senses other than our eyes.Archaeoacoustics is studied by testing the acoustic properties of prehistoric sites, including caves. Iegor Rezkinoff, a sound archaeologist, studies the acoustic properties of caves through natural sounds like humming and whistling.Archaeological theories of acoustics are focused around ritualistic purposes as well as a way of echolocation in the caves. In archaeology, acoustic sounds and rituals directly correlate as specific sounds were meant to bring ritual participants closer to a spiritual awakening.Parallels can also be drawn between cave wall paintings and the acoustic properties of the cave; they are both dynamic.Because archaeoacoustics is a fairly new archaeological subject, acoustic sound is still being tested in these prehistoric sites today. Architectural acoustics (also known as building acoustics) involves the scientific understanding of how to achieve good sound within a building. It typically involves the study of speech intelligibility, speech privacy, music quality, and vibration reduction in the built environment. Musical acoustics is the study of the physics of acoustic instruments; the audio signal processing used in electronic music; the computer analysis of music and composition, and the perception and cognitive neuroscience of music. Many studies have been conducted to identify the relationship between acoustics and cognition, or more commonly known as psychoacoustics, in which what one hears is a combination of perception and biological aspects. 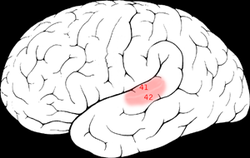 The information intercepted by the passage of sound waves through the ear is understood and interpreted through the brain, emphasizing the connection between the mind and acoustics. Psychological changes have been seen as brain waves slow down or speed up as a result of varying auditory stimulus which can in turn affect the way one thinks, feels, or even behaves. This correlation can be viewed in normal, everyday situations in which listening to an upbeat or uptempo song can cause one's foot to start tapping or a slower song can leave one feeling calm and serene. In a deeper biological look at the phenomenon of psychoacoustics, it was discovered that the central nervous system is activated by basic acoustical characteristics of music. By observing how the central nervous system, which includes the brain and spine, is influenced by acoustics, the pathway in which acoustic affects the mind, and essentially the body, is evident. Ultrasonics deals with sounds at frequencies too high to be heard by humans. Specialisms include medical ultrasonics (including medical ultrasonography), sonochemistry, material characterisation and underwater acoustics (Sonar). ^ C. Boyer and U. Merzbach. A History of Mathematics. Wiley 1991, p. 55. ^ Sparavigna, Amelia Carolina (December 2013). "The Science of Al-Biruni" (PDF). International Journal of Sciences. 2 (12): 52–60. arXiv:1312.7288. Bibcode:2013arXiv1312.7288S. doi:10.18483/ijSci.364. ^ "Abu Arrayhan Muhammad ibn Ahmad al-Biruni". School of Mathematics and Statistics, University of St. Andrews, Scotland. November 1999. ^ Schwarz, C (1991). Chambers concise dictionary. ^ a b Clemens, Martin J. (2016-01-31). "Archaeoacoustics: Listening to the Sounds of History". The Daily Grail. Retrieved 2019-04-13. ^ a b Jacobs, Emma (2017-04-13). "With Archaeoacoustics, Researchers Listen for Clues to the Prehistoric Past". Atlas Obscura. Retrieved 2019-04-13. ^ da Silva, Andrey Ricardo (2009). Aeroacoustics of Wind Instruments: Investigations and Numerical Methods. VDM Verlag. ISBN 978-3639210644. ^ Slaney, Malcolm; Patrick A. Naylor (2011). "Trends in Audio and Acoustic Signal Processing". ICASSP. ^ Templeton, Duncan (1993). Acoustics in the Built Environment: Advice for the Design Team. Architectural Press. ISBN 978-0750605380. ^ "Bioacoustics - the International Journal of Animal Sound and its Recording". Taylor & Francis. Retrieved 31 July 2012. ^ Acoustical Society of America. "Acoustics and You (A Career in Acoustics?)". Archived from the original on 2015-09-04. Retrieved 21 May 2013. ^ World Health Organisation (2011). Burden of disease from environmental noise (PDF). WHO. ISBN 978 92 890 0229 5. ^ Kang, Jian (2006). Urban Sound Environment. CRC Press. ISBN 978-0415358576. ^ Iakovides, Stefanos A.; Iliadou, Vassiliki TH; Bizeli, Vassiliki TH; Kaprinis, Stergios G.; Fountoulakis, Konstantinos N.; Kaprinis, George S. (2004-03-29). "Psychophysiology and psychoacoustics of music: Perception of complex sound in normal subjects and psychiatric patients". Annals of General Hospital Psychiatry. 3 (1): 6. doi:10.1186/1475-2832-3-6. ISSN 1475-2832. PMC 400748. PMID 15050030. ^ "Psychoacoustics: The Power of Sound". Memtech Acoustical. 2016-02-11. Retrieved 2019-04-14. ^ a b Green, David M. (1960). "Psychoacoustics and Detection Theory". The Journal of the Acoustical Society of America. 32 (10): 1189–1203. Bibcode:1960ASAJ...32.1189G. doi:10.1121/1.1907882. ISSN 0001-4966. ^ "Technical Committee on Speech Communication". Acoustical Society of America. ^ Ensminger, Dale (2012). Ultrasonics: Fundamentals, Technologies, and Applications. CRC Press. pp. 1–2. ^ D. Lohse, B. Schmitz & M. Versluis (2001). "Snapping shrimp make flashing bubbles". Nature. 413 (6855): 477–478. Bibcode:2001Natur.413..477L. doi:10.1038/35097152. PMID 11586346. ^ ASA Underwater Acoustics Technical Committee. "Underwater Acoustics". Archived from the original on 30 July 2013. Retrieved 22 May 2013. ^ "Structural Acoustics & Vibration Technical Committee". Archived from the original on 10 August 2018. Benade, Arthur H (1976). Fundamentals of Musical Acoustics. New York: Oxford University Press. OCLC 2270137. S.V. Biryukov, Y.V. Gulyaev, V.V. Krylov and V.P. Plessky (1995). Surface Acoustic Waves in Inhomogeneous Media, Springer. ISBN 978-3-540-58460-5. Falkovich, G. (2011). Fluid Mechanics, a short course for physicists. Cambridge University Press. ISBN 978-1-107-00575-4. Frank J. Fahy; Paolo Gardonio (2007). Sound and Structural Vibration: Radiation, Transmission and Response (Second ed.). Academic Press. ISBN 978-0-08-047110-5. Rayleigh, J. W. S. (1894). The Theory of Sound. New York: Dover. ISBN 978-0-8446-3028-1. Stephens, R. W. B.; Bate, A. E. (1966). Acoustics and Vibrational Physics (2nd ed.). London: Edward Arnold. Wilson, Charles E. (2006). Noise Control (Revised ed.). Malabar, FL: Krieger Publishing Company. ISBN 978-1-57524-237-8. OCLC 59223706. Wikimedia Commons has media related to Acoustics.